12 Summers Old is the band name. Fitting, because the members sound like they are twelve years old, making music for twelve year olds. I’m not twelve years old. So, to review this seems a bit hard, because now I have to go back to the times when I was twelve years old, and it isn’t exactly a time I wish to relive. This Could Get Dangerous is a rehash through a pop-punk movement I thought died five or so years ago. The winning opening lyrics, “I’m being honest/ Your lipstick ain’t doing much for me these days/ So wipe it off/ I need a new set of lips to take your place,” really sets the stage for the intellectual rigors your ear drums are about to go through. 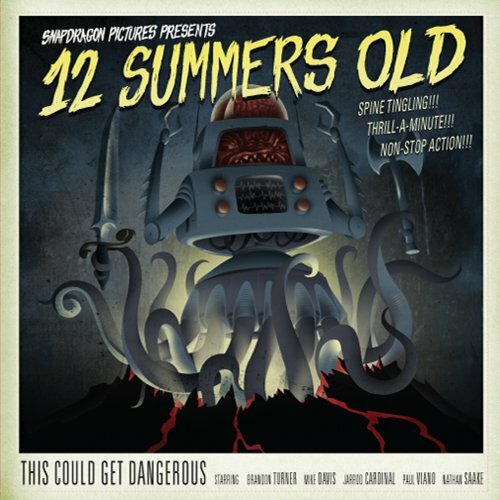 12 Summers Old play the safe brand of pop-punk. It isn’t even the kind that myself, as someone who used to listen to pop-punk, who repeatedly crowd-surfed and pogo-jumped like a giddy school child to New Found Glory, can get behind. Between the chord progressions, the slow and quiet fills, the slight backing vocals, and every other painful cliché of pop-punk, This Could Get Dangerous is a perfect exercise in the reasons why pop-punk is no longer the legitimate kind of music it once was. Everything this band does is a showcase in mediocrity. Mediocre guitars, drums, harmonies, lyrics, lyrical themes, promo photos… it’s all been done before — into the ground. The twelfth year of my life wasn’t very dangerous. I think I may have tripped and fell and sprained a finger. That is kind of like what listening to 12 Summers Old is like. Remembering an injury so lame that no matter how you spin it, you can’t make it sound cool — even to a twelve year old.